Who was Presley Lunsford, this young man who gave his life in service to his country for a cause he believed in? He was the second child of eight, born to Andrew Lunsford and Jane Gillialan/Gilliland. An exact date for his birth cannot be determined, but it was about 1841 in Ohio. Presley Lunsford is my 1st cousin 4 times removed. 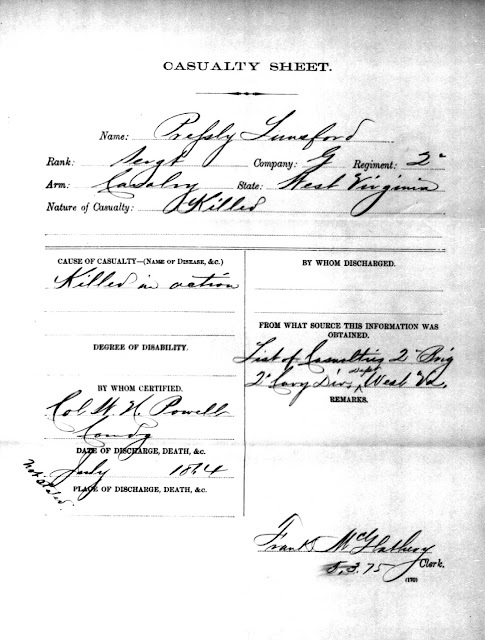 We first find Presley in the 1850 census living with his parents four siblings in Elizabeth, Lawrence Co., Ohio. 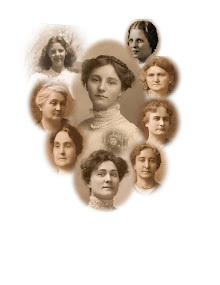 The surname Lunsford is often spelled Lunceford and varies from family to family and document to document. Presley’s father is working as a Laborer. Elizabeth Township is a small rural community. In the 2000 census there were only 2,914 people living in Elizabeth. I suspect it was much smaller back in the 1860’s. In 1860, just a year prior to the beginning of the Civil War, Presley is single, 19 years old and living with his parents and all 7 of his siblings, still in Elizabeth, Lawrence Co., Ohio. Both Presley and his father are working as Farm Hands. On 12 Apr 1861 the War of the Rebellion as it was called then, the Civil War, as we call it now began. Presley enlisted at Ironton, Ohio as a private on 28 Aug 1861, just four months after the war began. Term of enlistment was 3 years. He was in Company G, 2nd Regiment West Virginia Cavalry. His description is given on this page in his muster roll. He was 20 yrs. old, 5’ 7 1/2” tall, light complected, brown eyes, dark hair, born in Lawrence County, Ohio and his occupation was Farmer. This same muster roll page states he was promoted to Sergeant on 31 Dec. 1862. He just have been doing a good job for him to be promoted. Click on any image in this post to enlarge it. Presley got married during his time of service for the Union army. On 12 Mar 1863 he married Martha Campbell at Kanawha, Cabell, West Virginia. I wonder if they knew one another from his childhood or did they meet during his service? There were no children born to this couple. From statements in the file it appears that Martha was 18 years old when they married. Here is a copy of a certified statement of the marriage, found inside the pension file. This is just the kind of record you hope to find when you order pension files. It may be the only evidence you find for marriages, especially during the turbulent times of the Civil War. Sgt.Presley Lunsford was Killed in Action at Winchester, Virginia on 24 Jul 1864. He was about 23 years old at the time of his death. Here is the Casualty Sheet from his pension file. Martha applied for and received a monthly pension of $8, in his name. I expect it was difficult for a young woman to support herself in those days and even if she lived with family, every little bit would help. Martha remarried to Thomas Saunders on 20 Oct 1865 and the pension payments were terminated. Here are the notes I recorded as I read and re read this pension file. 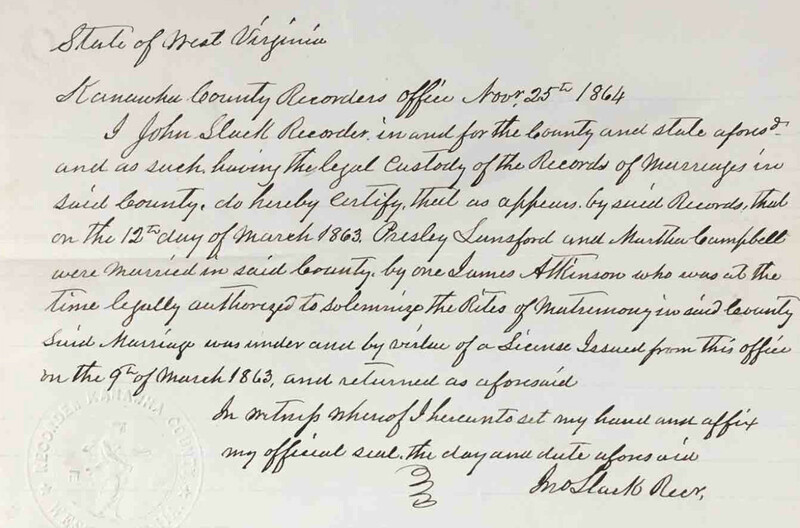 14 Statement by Kanawha County Recorder in the state of West Virginia on 25 Nov 1864. States that he certifies to the marriage of Presley Lunsford and Martha Campbell on 12 Mar 1863 in said county by James Atkinson . License for the marriage was issued by said office on 9 Mar 1863. 15 Widow’s Claim for Pension – Martha Lunsford appeared before Court of Common Pleas and states she is 18 yrs. old and a resident of Aid Township in Lawrence County, Ohio. She is the widow of Presley Lunsford who was a Sergeant in Company G, commanded by Capt. Ankram in the 2nd Regiment of West Virginia Voluntary Cavalry commanded by Col. William Powell. 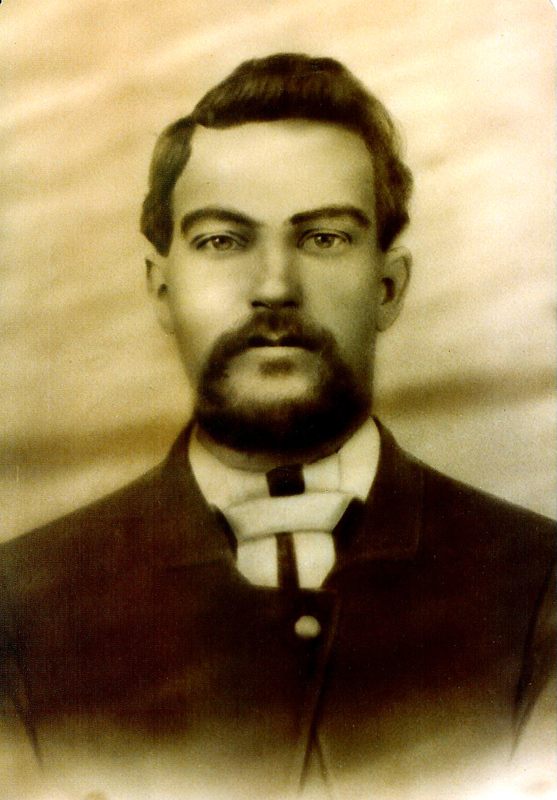 That Presley Lunsford was killed near Winchester in the State of Virginia on 24 Jul 1864 in a fight with the Rebels. She also claims that she married Presley Lunsford in Kanawha Co, W. VA and that her name before marriage was Martha Campbell. And that no children were born to this couple. Her post office address is Ironton, Lawrence Co., Ohio. 16 Witnesses to Martha Lunsford’s statement were John McMahan and Henry Lunsford residents of Lawrence Co., Ohio. State that since the death of her husband Martha Lunsford has not remarried as of 17 Sep 1864. 18 Letter dated 14 Jun 1876 in Ironton, OH to Honorable J.A. ______, Commissioner of Pensions. This letter states that Martha Lunsford married Thomas Saunders 20 Oct 1865 and that her attorney Stephen P. Calvin died some six or seven years ago. 21 Letter from probate Judge Geo. W. Thompson of Lawrence Co., Ohio, dated 14 Jun 1876 stating that Martha Lunsford and Thomas Saunders were issued a marriage license on 19 Oct 1865 in said county. And, that they were united in marriage on 20 Oct 1865 by Jeptha Clark, Justice of the Peace. 25 Claimant’s answer to letter asking why she long neglected to prosecute her claim. States she lives far from town at Vernon Furnace in Lawrence Co., OH and has been married a second time for ten years and her name is now Sanders (note difference spelling here). NOTE: My system for reviewing these files has always been to record each page number and what I found on that page. I also extract that particular page from the PDF pension file and save it separately. Some of these files can be over 200 pages long. To think I will remember which page number contains which piece of information would be pointless. I don’t have any idea where Presley’s final resting place is. However, I have created a memorial for him on FindAGrave so that he is never forgotten. You may visit his memorial here. While researching this family, I learned that Presley’s older brother, William H. Lunsford also served in the Union Army and survived the war. I obtained an image of William from some of his descendants and use it here with their permission. He too had dark hair and I wonder how much Presley may have looked like his older brother. If you have any additional information regarding this post, or are related to this family, please contact me. My source for obtaining Civil War Pension Files is Twisted Twigs Genealogy. There is a link to their home page in the right column of this blog. Thank you for you wonderful idea for Notes for a pension file. I am having the memory issue right now with a 200+ page file. I have transcribed the entire file, using each document date as part of the transcribed document file name. This allows me to put the transcribed documents in chronological order, but your Pension Preview Notes would help so much. The only thing I might do, is add another column that refers to my transcribed document date/name. Thank you again. You’re quite welcome. I decided it wasn’t necessary to transcribe the entire document as a lot of it was superfluous and repetitive. So, instead, I pick the pages that have items of importance and record them.